Leonard was born in September 1892, the son of Albert Cramp and his wife Annie (née Williams). In 1891 the family were living at 17 Carnarvon Street, Newbury (now part of West Street) but had moved by 1894 to 1 Sunnyside (now 44), Gloucester Road. Around 1897 they moved again – but only next door to 1 Sunnyside (45) Gloucester Road. From there the next move was in 1905 to 5 Hampstead Terrace, Pound Street and then to 2 Milton Villas, London Road in 1913 (now part of the 'Georgian House' office building). Throughout this trip around Newbury Albert was working in the clothing trade (variously describing his occupation as assistant, tailor or outfitter). ... Lord Derby’s recruiting scheme has resulted in a number of young men enlisting from Newbury, and doubtless there are others who will go. Among those who have been accepted are Mr G P Hopson, Mr A Hill, Mr L Cramp, and Mr R J Drewell, four of our servers, and Mr Winkworth, a member of the Men’s Bible Class. Mr G L Pyke has been rejected on account of his eyes, his brother, Mr Cecil Pyke, one of our Sunday School teachers, has been accepted for service at home, and Mr R Bell has been rejected. All honour to those who have tried as well as to those who have been accepted, for they have shown their willingness to serve their country in her need. . . . The Derby Scheme was a last ditch attempt to avoid the need to introduce conscription; under the scheme men ‘attested’ (signed up) but then went home to await to be called up with their group when needed. Grouping was based on age and marital status – younger single men would be called before older or married men. This gave the scheme its official name of the Group Scheme. It was a failure attracting far more older married men than younger singles. However, it was a last opportunity for men to enlist into units of their choice, once conscription arrived it was the army that decided where a man would serve. Leonard enlisted into the London Regiment, which was a Territorial only regiment. He became a member of the 2/13th (County of London) Princess Louise's Kensington Battalion (179th Brigade, 60th Division), possibly joining the battalion in time to spend a short period in Ireland when troops were rushed there following the Easter Rising. The battalion was only in Ireland for just over two weeks before they returned to England where the 60th Division was getting ready to go to France. On 21 June 1916, Leonard was definitely with the battalion when it crossed the Channel. The 60th Division was not in France for long enough to take part in any major operations in France - in November 1916 it sailed from Marseilles, bound for Salonika. In Salonika the battalion took part in the Battle of Dorian, but Leonard was not with his comrades as they went into action; he had been admitted into the 28 General Hospital on 15 March 1917, suffering from dysentery. From there he was transferred to a hospital ship, the Dover Castle, which took him to Malta where he was admitted into the Military Hospital at Imtarfa (now Mtarfa) . The efforts of the medical staff in Malta were to no avail and he was transferred to England on 12 July. Back in England he was admitted to Addington Park Hospital where he tested negative for a variety of diseases (typhoid, paratyphoid, dysentery). Before long he showed some improvement and was sent to a convalescent hospital at Barton-on-Sea on the edge of the New Forest. On 21 September he was finally passed fit and returned to his regiment at their depot at Green Street Green near Bromley in Kent. He did not return to the 2/13th Battalion overseas; perhaps he would have rejoined them, or another of the regiment’s battalions in France, but his health failed him again. On 7 December 1917 he was admitted to Ontario Military Hospital in Orpington, Kent. This time the problem was in his chest and it did not take long for the medical staff to decide to make the case for his discharge from the army as permanently unfit for service. The diagnosis was tuberculosis pleurisy and the prognosis was not good. On 12 February 1918 a medical board accepted the medical evidence and Leonard was discharged from the Army. Very soon after his discharge Leonard married Rose Durman, it seems that they set up home together at ‘Fairfield’, Swan Street, Kingsclere. Leonard was given a disability pension of 27s 6d per week for 26 weeks; after that period a further pension of 16s 6d was awarded for another 52 weeks. Sadly Leonard did not live to find out if he would get any further award; he died on 18 December 1918. The causes of death were (1) Persistent dysentry, 1½ years and (2) Cirrhosis of the lungs. He was buried on 23 December in the churchyard at Kingsclere. Probate of his estate was granted to Rose on 27 January, he left effects to the value of £212 9s 1d. 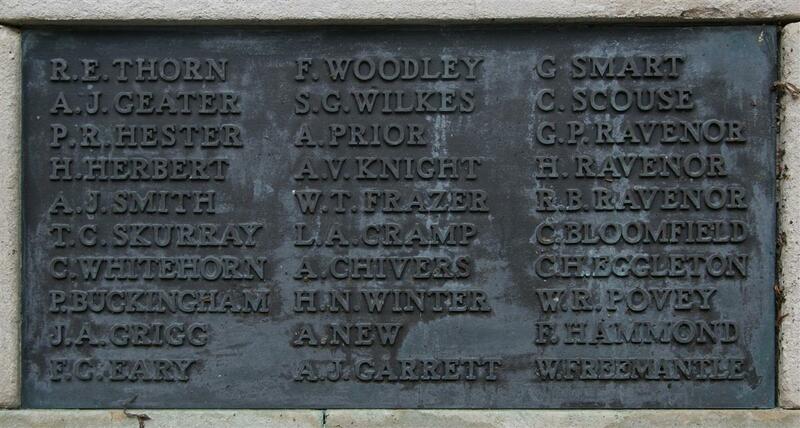 Leonard Cramp's name on Newbury War Memorial (middle) - click to enlarge. One result of his death occurring after his discharge is that his name was not recorded on the national roll of honour held by the Commonwealth War Graves Commission. This ommission was rectified on 18 December 2014 when the Commission announced that Leonard had been added to the roll following a review of evidence submitted to them by Newbury Remembers (via the excellent In From the Cold Project). Locally Leonard is remembered on Newbury's Town War Memorial and also on the parish memorial board and roll of honour in St Nicolas' Church, Newbury. Thanks to Karen Newbery for her help on the Kingsclere end of this story and finding proof of his burial. Thanks also to Terry Denham at the In From the Cold Project.